Trailers: What Style Are You? 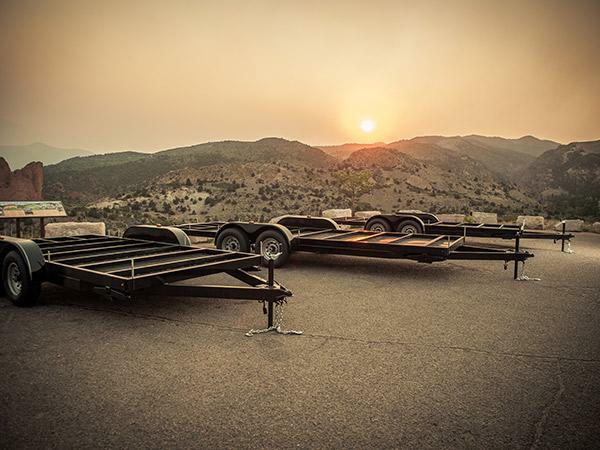 Did you know that there are now THREE different Tumbleweed trailer designs? It doesn’t matter if you’re building a classic Tumbleweed Elm, a modern Mica or a custom design of your own, Tumbleweed has the right trailer for you! The Tumbleweed Utility Trailer design now comes in four lengths: 18’, 20’, 24’, and 26,’ and is the perfect trailer for a Tiny House RV design with a loft, such as the Linden, Elm and Cypress, because it maximizes interior height. By building between the wheel wells, the Utility Trailer design allows for exterior eaves that will extend to the maximum legal width of 8’6.” Eaves are gorgeous aesthetically, but they also protect your siding from rain and snow damage. The Deck Over Trailer is the ideal trailer for single-story Tiny House RV designs, like the Tumbleweed Mica. The Deck Over has maximized trailer width by building over the wheel wells. This trailer comes in three lengths of 20′, 24′ and 26,’ all outfitted with two 7,000 lb axels. NEW!!! Interested in building lower AND wider? The Low-Wider trailer maximizes interior space (height and width) in your Tiny House RV by building around the wheel wells. This trailer comes in lengths of 18′, 20’, 24’, and 26,’ all outfitted with two 7,000 lb axels. The Low-Wider trailer is a good fit for custom Tiny House RV designs, as there aren’t any Tumbleweed designs for this trailer (yet). Whenever someone asks me what are the most important pieces to “splurge on” when building your own Tiny House RV, I always say: “Your trailer, windows and roof.” When I built my Tiny House RV, I had zero building experience and renovating an old trailer requires welding – something I was not prepared to do. By purchasing one of the first Tumbleweed trailers, I saved myself hundreds of work hours and I knew I was getting a quality product. By purchasing a Tumbleweed Trailer, I felt safe towing my house over 22,000 miles. I knew the heavy duty 5,000 lb axels and radial tires were able to withstand the load, and they did. Tumbleweed trailers are tested to be perfectly balanced for Tiny House RV designs. Brakes, lights and flashing are included and designed specifically for Tiny House RVs. If you want more information on delivery, pricing and specs for any of these trailers, click here to download your free study plans. Jenna Spesard is currently living and traveling around North America in a DIY Tumbleweed Cypress with her partner, Guillaume. They are photographing and writing about Tiny Homes and their adventure. Follow their informative blog.